Daniel Erickson, an Iowa State graduate student, uses a simple screen to harvest fungi from a pilot plant developed by a team of Iowa State University researchers. The reactor is the silver pipe to the right of Erickson. Credit: Jeni Maiers/Center for Crops Utilization Research. Now he knows the idea, which produces a new animal feed and cleans water that can be recycled back into ethanol production, works more efficiently in batches of up to 350 gallons than on a lab bench. 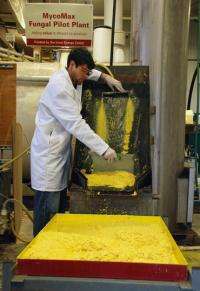 "We're learning we can reliably produce good quality and good quantities," said van Leeuwen, Iowa State's Vlasta Klima Balloun Professor of Engineering in the department of civil, construction and environmental engineering. What van Leeuwen and a team of Iowa State researchers are producing is a fungus, Rhizopus oligosporus, that makes a high-quality, high-protein animal feed from the leftovers of ethanol production. The process of growing the fungus also cleans water from ethanol production so that it can be recycled back into fuel production. And the process, called MycoMeal, could one day produce a low-cost nutritional supplement for people. The project has two patents pending and has won several major awards, including a 2008 R&D 100 Award presented by R&D Magazine, the 2008 Grand Prize for University Research presented by the American Academy of Environmental Engineers and a 2011 Honor Award in University Research from the academy. The project also contributed to R&D Magazine naming van Leeuwen its 2009 Innovator of the Year. The research team working on the project is led by van Leeuwen and includes Nick Gabler and Mike Persia, assistant professors of animal science; Mary Rasmussen, a post-doctoral research associate in food science and human nutrition; Daniel Erickson, Christopher Koza and Debjani Mitra, graduate students; and Brandon Caldwell, a graduate of Iowa State. The project is supported by a three-year, $450,000 grant from the Iowa Energy Center and a Smithfield grant from the Office of the Iowa Attorney General. Lincolnway Energy of Nevada, Cellencor Corp. of Ames and Iowa State's Center for Crops Utilization Research and BioCentury Research Farm are also supporting the project. For every gallon of ethanol produced, there are about five gallons of leftovers known as stillage. The stillage contains solids and other organic material. Most of the solids are removed by centrifugation and dried into distillers dried grains that are sold as livestock feed, primarily for cattle. The remaining liquid, known as thin stillage, still contains some solids, a variety of organic compounds and enzymes. Because the compounds and solids can interfere with ethanol production, only about 50 percent of thin stillage can be recycled back into ethanol production. The rest is evaporated and blended with distillers dried grains to produce distillers dried grains with solubles. The researchers add fungus to the thin stillage and it feeds and grows into a thick mass in less than a day - van Leeuwen calls it "lightning-speed farming." The fungus removes about 60 percent of the organic material and most of the solids, allowing the water and enzymes in the thin stillage to be recycled back into production. The fungus is then harvested and dried as animal feed that's rich in protein, certain essential amino acids and other nutrients. It can also be blended with distillers dried grains to boost its value as a livestock feed and make it more suitable for feeding hogs and chickens. Van Leeuwen said the production technology can save United States ethanol producers up to $800 million a year in energy costs. He also said the technology can produce ethanol co-products worth another $800 million or more per year, depending on how it is used and marketed. Now that the project has moved from a campus lab to the Iowa Energy Center's BECON facility in Nevada, van Leeuwen said researchers are working to improve the process at larger scales. "We're adding and subtracting, doing things differently and redesigning our process all the time," he said. As the project has successfully scaled up, so has van Leeuwen's optimism that the process could help the biofuels industry. "Implementation of this process addresses criticism of biofuels by substantially lowering energy inputs and by increasing the production of nutritious animal feed," van Leeuwen said. "The MycoMeal process could truly revolutionize the biofuels industry." This article has so many gems like "lightning-speed farming" and making it into a nutritional supplement for people. Haha. How orwellian. I think it sounds like a good idea. I think that by itself it's no cure-all, but if fuel efficiency in cars bumps up enouch, and energy and feedstock costs of ethanol come down enough, it might make a serious dent in our energy issues. Improving ethanol production economics may be far more important to chemical and industrial applications than for transportation. It may have more impact on fuel prices by eliminating some transportation needs than by fueling the trips. While $800 million is no small number, considering we produced 13 billion gallons of ethanol in 2010, that only amounts to savings of 16 cents/gallon of ethanol. And given that perhaps up to 10% of what you buy at the pump is ethanol, that's only 1.6 cents/gallon. That's a good improvement, but not a major breakthrough. Thanks for the numbers, that really helps put this in perspective of the big picture.